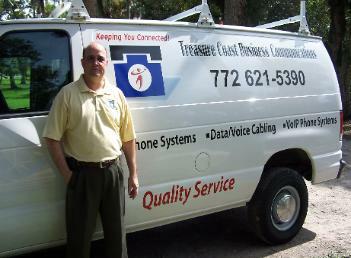 The team of dedicated professionals at Treasure Coast Business Communications has been providing outstanding, reliable telecommunications services to businesses on the Treasure Coast for over a decade. In fact, our technical staff averages more than 25 years of experience and is committed to providing dedicated and dependable service that always puts the customer's needs first. Treasure Coast Business Communications specializes in designing, implementing and supporting telephone system solutions that provide a competitive advantage and unparalleled flexibility as your business grows. Most importantly, we do this by saving you money and improving your productivity. Plus, partnering with Treasure Coast Business Communications provides you with the peace of mind that comes with proactive maintenance, 24/7 monitoring and dependable on-site and remote support for all your telephone system needs. Simply put, keeping you connected is what we do.